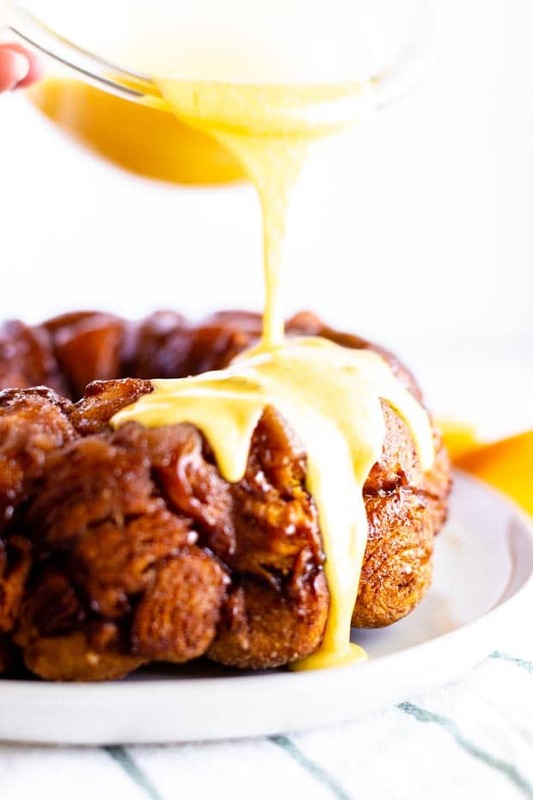 This easy orange monkey bread with a delicious glaze is the perfect recipe to enjoy with family! I love this time of year. 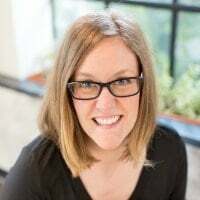 I’m especially excited this week because we have family visiting from out of town right now, which makes my heart oh-so-happy. It’s hard living away from family — I’m thankful we’re a tight knit crew despite the miles. When we do have time together, it’s that much more special. Needless to say, our entire gang is so excited for this visit. The past few days, we’ve gotten ready for their much-anticipated arrival. I’m even making the most delicious monkey bread made with orange danishes to celebrate! (More on that in a moment.) 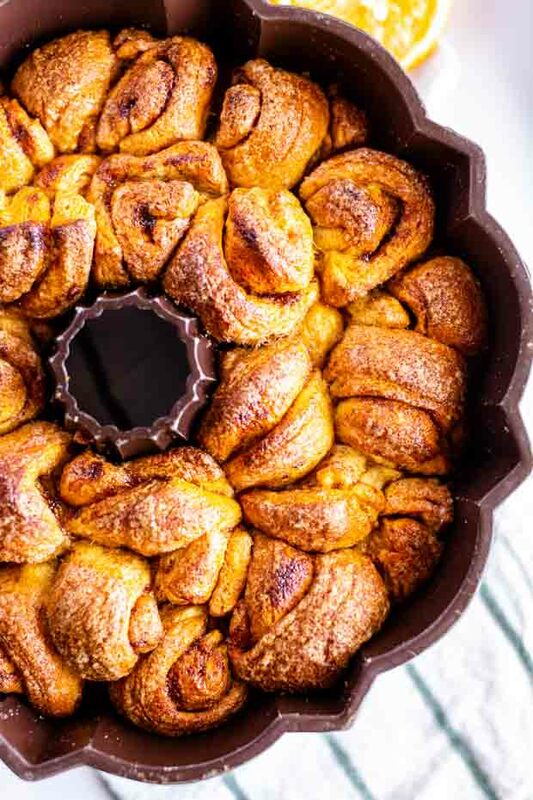 For another great twist, try cinnamon roll monkey bread! We are ready for all sorts of shenanigans with some of our favorite people! 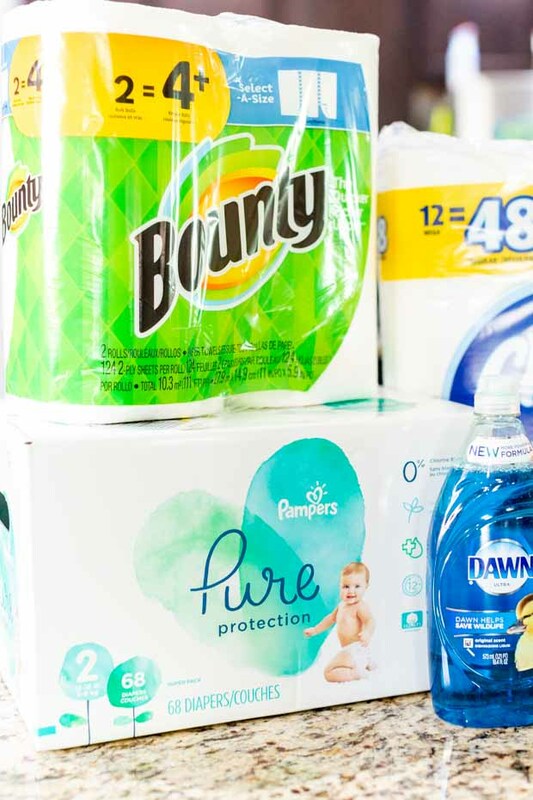 With the family visit and holiday coming up, my boys and I headed to Walmart to stock up on all the supplies we would need for an adventure-filled few days with our family. I often take advantage of shopping online and curbside pick up these days — it’s such a time saver for me. I’m able to pick out everything I need and enjoy great savings without taking time to be in the store. What are my staples? Let me tell you! I’ve got Tide PODS Ultra Oxi for the laundry… because busy boys generate an endless pile in the laundry hamper. Bounty Select-A-Size Paper Towels… because there are always messes to be cleaned up! The bathrooms get stocked with Charmin Ultra Strong Toilet Paper and Crest Gum Detoxify Deep Clean Toothpaste. In the kitchen, I trust Dawn Original Dishwashing Liquid for the mounds of dishes our foodie family will generate. When we arrive home, my boys are in charge of helping to unpack the groceries. They’re great little helpers and I love seeing their initiative at work. Another job they hold title to is distributing paper products and toiletries around the house. They put toilet paper in the bathrooms and make sure that paper towels are stocked in the kitchen, bathroom and laundry room as well. With active little guys, there is no shortage of opportunities for Bounty Select-A-Size to be used around our house. While planning for this week, I made a menu — including several sweet treats — to share with family. I love spending time in the kitchen and creating food for the people I love. But somehow in all the hubbub, one of my original treat ideas became a total flop. I was so disappointed… I hate when a recipe doesn’t turn out the way you think it will. I panicked for a minute, to be honest. I always get stressed when I wait to the last minute to prepare something and then it doesn’t go as planned. After the flop, I was feeling a little frazzled and I was standing in the kitchen, contemplating what to do. I had waited until the last minute to bake and I didn’t want to be empty handed. 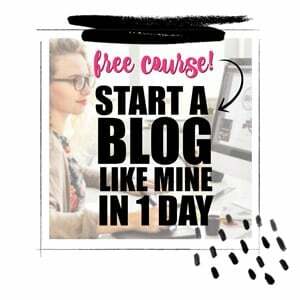 I was pretty irked with myself for waiting until the day of to try something new. Enter my dad: I love spending time with him and he never ceases to make me feel better. He suggested we have a special breakfast, which inspired me. He loves monkey bread — it’s one of his guilty pleasures. I decided to shake up my traditional monkey bread recipe and add a new twist by incorporating oranges. We love oranges. I must say, this orange monkey bread recipe turned out totally delicious and it’s a new favorite that I know we’ll enjoy again soon. Funny how a little fresh perspective can make things feel better. I forgot all about the flopped recipe once we had this delicious treat! Another plus to this recipe: you only need a handful of items. I’m all about the quick treats when spending time with family. While I love cooking and baking and being in the kitchen, I don’t want to be tied down with a complicated recipe while we’re enjoying family time. Quick fixes for the win, especially while enjoying the summer holiday. 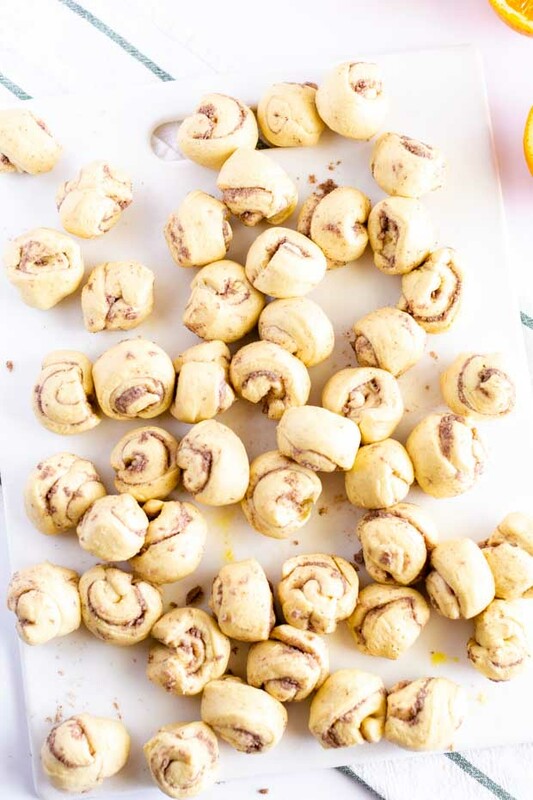 You’ll need 3 cans refrigerated orange danish rolls, white sugar, cinnamon, orange zest and melted butter. For the glaze, I used the orange glaze that came with the refrigerated danish rolls, orange juice and powdered sugar. Start by removing the rolls from the can and cut each roll in half. Roll each half into a ball and set aside. 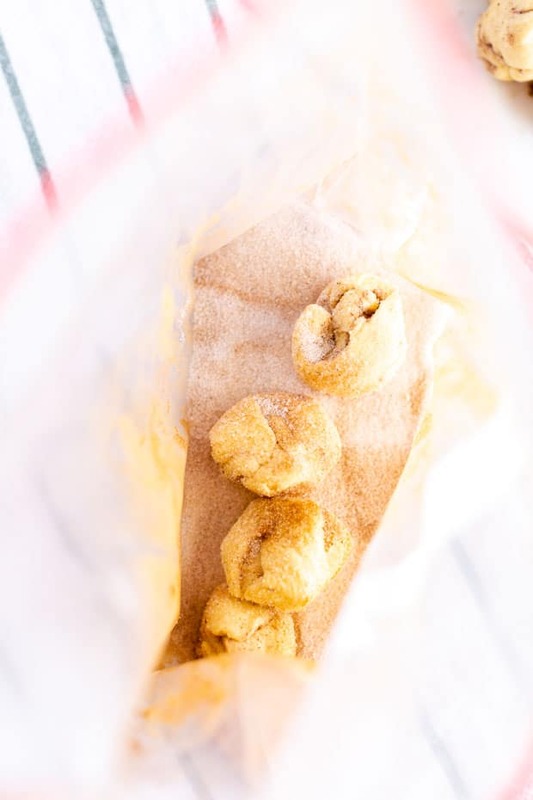 In a large plastic storage bag, add sugar, cinnamon and orange zest. Place balls of dough, 4-5 at a time into the sugar and shake to coat. 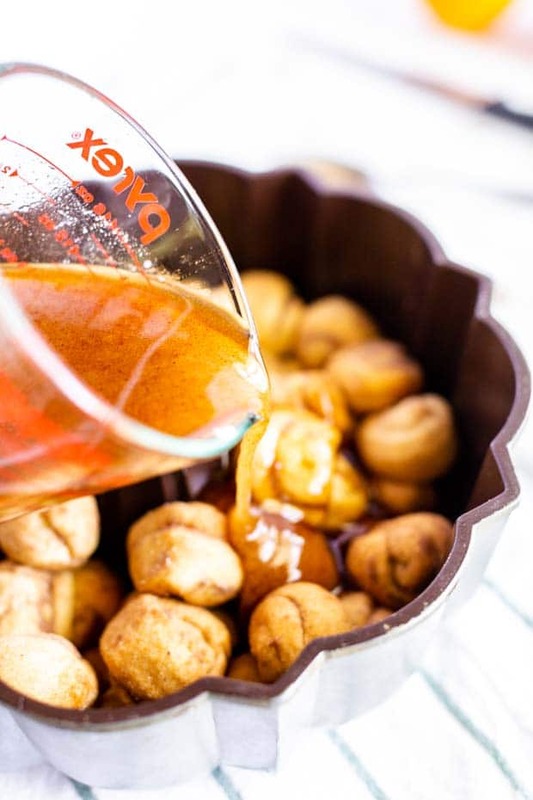 Place coated balls of dough into a greased bundt pan. Stir the remaining sugar into the warm butter and stir for 1-2 minutes until the sugar starts to dissolve. Pour the butter and sugar over the pieces of dough in the bundt pan. 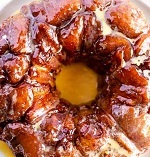 While the monkey bread rests, mix the orange glaze with orange juice and powdered sugar. Place a serving platter over the top of the bundt pan and flip over so the monkey bread falls out onto the serving platter. Top with orange glaze and serve. I served our orange monkey bread with tall glasses of ice cold milk and scrambled eggs. It was a hearty breakfast that everyone loved. You could also serve it for dessert. Or snack time. Or really… anytime. Because it’s delicious and you can’t go wrong. Of course, my boys ended up with sticky fingers and needed Bounty to help clean up. I didn’t mind though… I love the memories that we’re making together this summer. 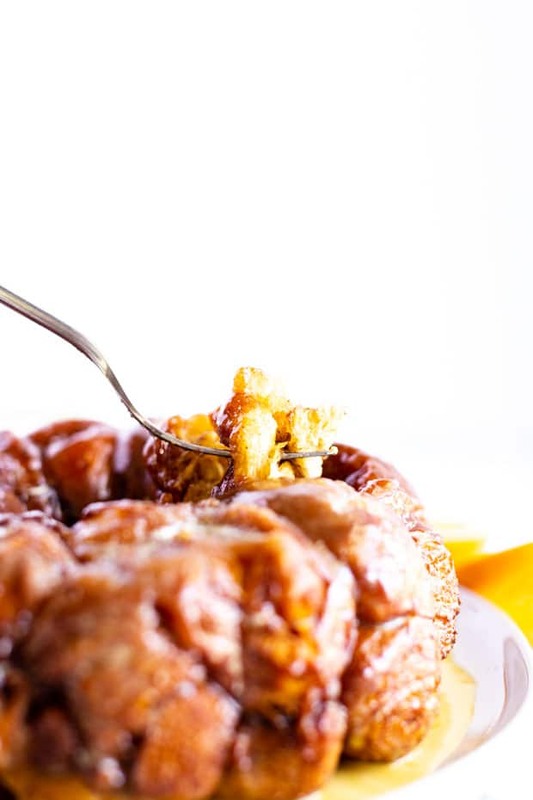 I hope your family is making special memories together as well — and that you enjoy this orange monkey bread soon! 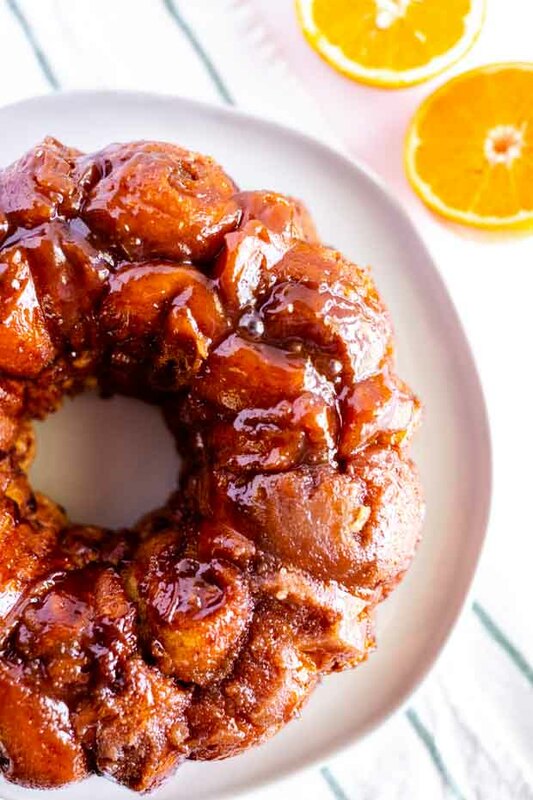 This simple orange monkey bread recipe comes together quickly and is absolutely delicious! Remove rolls from can and cut each roll in half. Roll each half into a ball and set aside. Bake for 35-40 minutes at 350. I will definitely try this for our family getaway!